Claudiani Hotel is a new hotel recently refurbished in a skilfully restored building that belonged to a noble and ancient family of the Marche Region until the early nineteenth century. 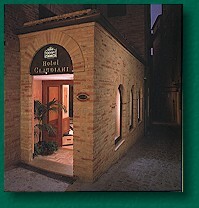 Situated in the heart of Macerata, in a quiet and favourable position, Claudiani Hotel offers all the advantages of a well known hospitality. Each of its forty rooms (three of which are suites) is equipped with an elegant bathroom or shower, direct dial phone, air conditioner, mini-bar, personal safe, wireless internet access, radio and television set including satellite TV and pay TV. 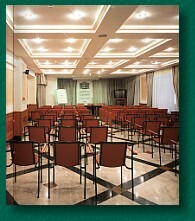 An elegant conference room can accommodate up to 100 PERSONS with technical equipment suitable for business meetings. Guests can avail themselves of a fine bar at Hotel Claudiani. Also, an inner hotel garage allows guests to enter the heart of the town and thus avoid parking problems.